Maui Now : ANALYSIS: What’s With All The Shark Attacks? ANALYSIS: What’s With All The Shark Attacks? WARNING: A graphic photo of a recent shark bite on a victim’s leg accompanies this article – do not scroll down this page if you are susceptible to such images. 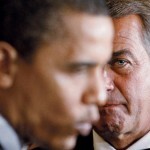 An alternate link without the photo is posted here. Tiger shark – the species most likely to attack humans in Hawaii. Photo by James Sapara. The seven shark attacks in Maui County waters this year have many asking if there’s an increased danger of getting in the ocean right now. Theories, ranging from an increased green sea turtle population, to the beginning of whale season, to “it’s one rogue shark,” have been implicated as possibilities for the increase in attacks. The prevailing theory at the moment is that female tiger sharks migrate from the Northwestern Hawaiian Islands region to the main islands at this time of year presumably to pup (give birth), including in shallow waters where people swim. Whether it’s the pupping that leads to more aggressive behavior, or just that an increased presence of sharks lead to a higher likelihood of attacks, is unclear. 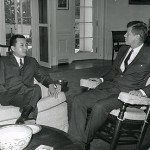 That theory’s origins come from a recent study by Carl Meyer, assistant researcher with the Hawaii Institute of Marine Biology. 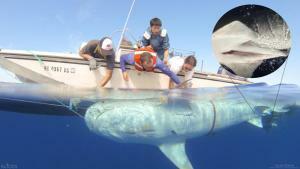 Over 100 tiger sharks have been tagged and tracked over two decades, leading to the findings. To electronically tag tiger sharks, they are tied by tail and then turned upside down, inducing what is known as “tonic immobility.” UH photo. Meyer’s theory seems to coincide with data recorded by the state Division of Aquatic Resources. Historically, there is a clear increase in attacks September through November, while the least amount of attacks occur in the summer (despite more people being in the ocean), according to the DAR’s Maui-based Education Specialist Russell Sparks. It doesn’t explain the higher number of attacks this year compared to other years though, despite what is being widely reported in other media. Meyer says the statistical link between the migration period and the attacks is hard to determine, due to factors such as the low number of attacks comparatively (e.g. three last year versus nine this year) and that tiger sharks were not positively identified as the attackers in every case. But the state’s data does beg the question of exactly how much more dangerous it is being in the water now (fall to winter) rather than other times. Of Hawaii’s nine attacks, five of them happened in Maui waters this fall in a 90-day window. The nine shark incidents so far in 2012 in Hawaii is the highest since the 1980s (the next closest is 2002 with eight), according to state data. (Note: Meyer counts 12 attacks this year Meyer has since concurred with the DAR’s figure of nine unprovoked attacks as the total). 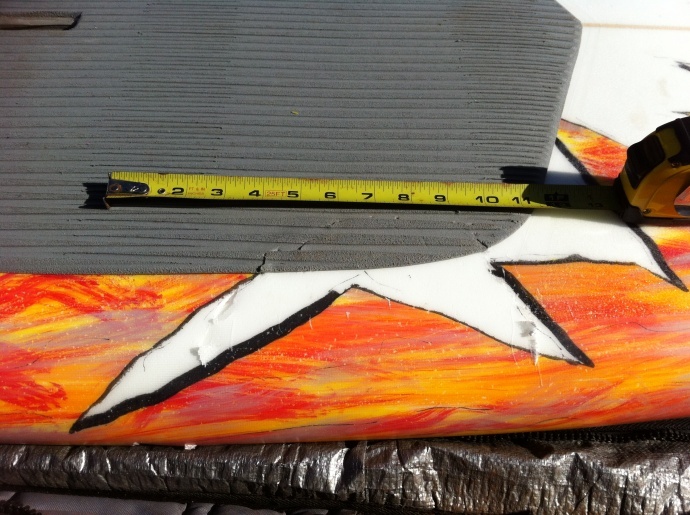 The SUP board after the Kanaha Beach shark attack on 10/18/12. If there are no injuries in an attack such as this one, it still counts as an incident to the Division of Aquatic Resources. Photo by Deb Lynch. It’s worth noting the DAR’s criteria for registering an incident — it has to be “unprovoked,” which means an attack on a live human in the ocean who is not engaged in an activity which typically attracts sharks. The November 4 attack on spear-fisherman Marc Riglos near Waiehu was only considered unprovoked because no fish had been speared before the attack. Also, if an attack results in no injury – like if a surfboard is bitten – it is still registered among the incidents. 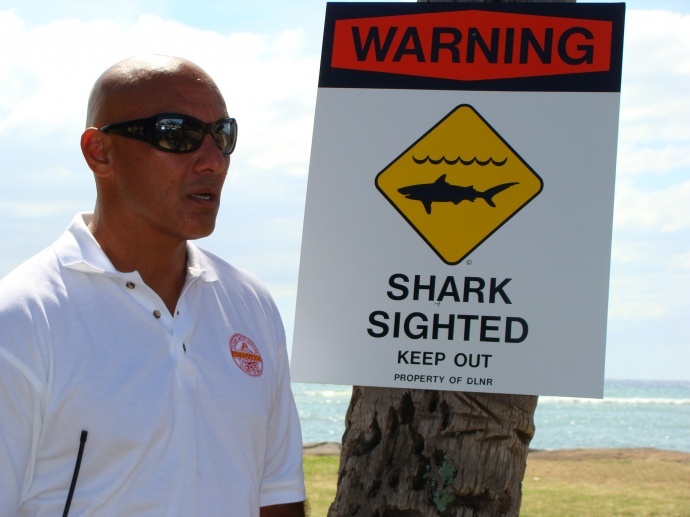 There has been one shark attack that resulted in death in the past decade in Hawaii. That was Willis McInnis, 57, a Maui surfer who suffered a severe bite in his right thigh in 2004 and died before he could be brought to shore. The previous fatality was almost 12 years before that. The Institute pegs the average number of people in Hawaiian waters each day to be in the thousands. The consensus between state officials employed to monitor the situation, and marine scientists such as Carl Meyer, is that the likelihood of attack is still incredibly low even in the fall (or “migration” months in Meyer’s theory). 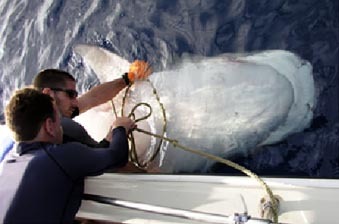 As for the suggestion that the same tiger shark is involved in all the recent attacks on Maui, the evidence leads away from this “rogue shark” theory. 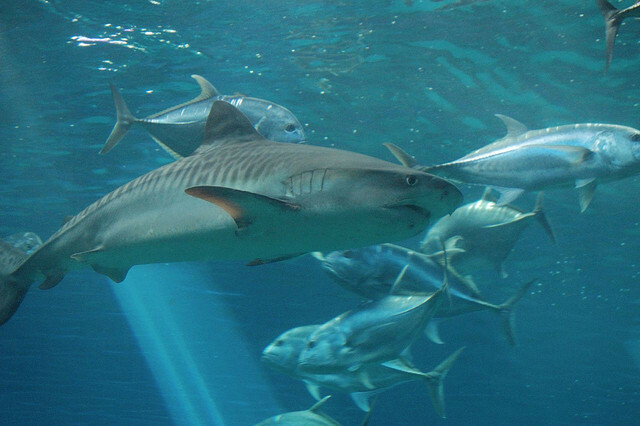 Tiger sharks are typically long-range sporadic travelers rather than territorial, according to scientists. Decades of tracking studies initiated by Kim Holland in the ‘90s appear to dispel the assumption that tiger sharks are “site attached” to home coastal ranges — instead they arrive, hunt and leave. And again, not every attacker was positively identified as a tiger shark. Sparks, the man tasked with tracking the attacks on Maui, says that despite the current upswing in shark incidents, a simple look at the data suggests statistical insignificance. The result of a tiger shark attack on the leg of Marc Riglos while heading to a spear-fishing expedition near Waiehu (11/4/2012). The shark was reportedly 15 feet long. Courtesy photo. 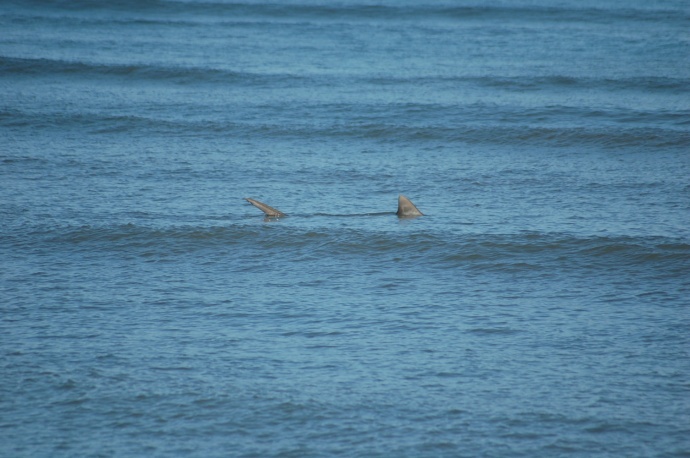 As for shark attack avoidance: Surfing is the number one risk, mainly because of the crashing waves creating murky water. But other factors associated with surfing increase the risk, such as surfers seeking isolation to keep the waves for themselves. Theories like how the bottom of a board might look to a shark is speculative, says Sparks. But whatever you’re doing in the water, Sparks stresses that you will greatly diminish the odds of being attacked by staying away from murky water, as tiger sharks hunt in the murkiness to gain the element of surprise over their prey. And despite the many warnings about swimming at dawn, dusk or night, Meyer points out that 60% of shark bites occur between 10 a.m. to 4 p.m, and that tiger sharks don’t adhere to the day-night cycle and will feed at any time. The state’s data also reveals some other interesting facts about attacks, like that a shark bite appears to be most likely to happen to a leg or foot. This may be a small comfort for some, as there is less risk to vital organs contained in the torso, less-protected arteries in the head and neck, or cosmetic damage to the face. Personally, Sparks admits he does think about a shark attack while he’s swimming in the ocean, despite knowing the odds — particularly since he has to study the graphic photos of shark attack victims as part of his work.